When the cepediana are all grown up and sold to their new keepers I may put a pair of thumbnail darts in here. This is the smallest tank I own so had to have a good think of how to do the layout because I needed it to be simple, but also wanted a proper water area. Ok so step 1 - Get a tank. I wanted to get one from Richie B but courier would have made it too expensive in the end so I opted for a 30x30x45cm exo terra which has lots of modifications to make it fully suitable. THe next thing I wanted to work on was a canopy for the tank as exo terra don't make anything suitable to hold 2 compact bulbs for such a small tank. I didn't take many progress pictures but you can see in Picture 1 I have cut all the wood I'm gonig to use to size. Next I started on the pump for the waterfall. For such a small tank an external pump would have been total overkill but I wanted the internal pump to be easily accessible incase anything goes wrong and also keep the water nice and clean. So I got a small plastic container and soldered lots of holes round the bottom, before placing the internal pump in and packing it will cheap filter sponge. The water tubing and the wiring both go through seperate 1" PVC pipe which runs up the back of the tank (no pics sorry!) and is hidden by the expanding foam. This means I can take the pump out or take out the tube to check for blockages/clean easily without destroying my background. Next I started on the expanding foam. I got a small black pot with no drainage for a plant and drilled a large hole through the bottom - I attached some water line into the hole and then sealed around it. Then I placed the pot on the background with the water line running to the bottom. This means the plant pot will not drain into the expanding foam, eventually rotting everything. I also got some slate from the garden and positioned them for my waterfall. Then I did the expanding foam for the right hand side and placed a nice piece of mopani wood in for effect. I then used some cork bark and expanding foam to make a nice natural slanted seperator for the land and water areas. Once everything was dry I added lots of holes in the bottom couple of cm of this seperator so that water could move freely between both sides but it still acted as a physical barrier to soil etc. This seperator was the first thing to be covered in eco earth - I used brown 'Gold Label' pond silicon which was sooo worth the money - sticks things strongly immediately, and because its brown it still looks fine if you miss a couple tiny bits with the eco earth! I also sanded down and carved the expanding foam background a bit, as it always expands slightly more than you want it to in places! Next I carried on covering everything in brown silicon and eco earth... A tedious job as anyone who has done it will know. Next I tacked the top of the tank. The mesh lids exo terra give out are pretty s**t for humidity or flies so I got rid of it altogether. I used some special UVB passing acrylic, shaped it to fit the top of the exo terra and sealed it completely on to the top as I'm not realistically going to want to take the lid off again anyway. I drilled a hole for the misting nozzle and installed that. I left a 2 inch gap at the back which I sealed ultra ultra fine stainless steel mesh into for ventilation. I also took out the inside panel of the front ventilation (it is removable though most people don't realise). I then sealed the ultra fine mesh into the gap and then replaced the inside panel so those vents are now also FF proof. Then I added my clay pebbles to the bottom and my stones and gravel to the water area. For the day geckos I'm keeping the water level ultra shallow but could use less stones and make it a bit deeper for darts. Next I added my weed membrane and a substrate of orchid bark, eco earth, shredded oak leaves, spag moss and springtails and woodlice from my spare cultures. I added some plants (I have since also added a parlour palm and moss) and placed it beside my dart frog tank and hey presto! All done! Hooked up the Mistking, put the canopy on, put the lights on timers etc etc. Left it for a day then added the cepediana. I did the entire thing in 2 days because I was leaving for Santorini and had to have everything ready so the cepediana would be in a tank I could connect to the misting system, light timers etc. as the person I had coming to look after the animals would only be here every other day. So it was all a bit frantic. Finally.... I went to Santorini, relaxed, got married & drank lots of greek beer! pixieboy, samurai, Oli P C and 3 others like this. Congratulations on your wedding.Is Santorini as nice as the photos?. 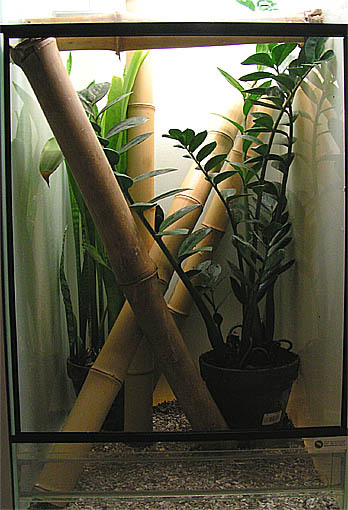 I think the vivarium is more suited to frogs than lizards.For Phelsuma you will need more branches and bamboo in order that they can bask.I am not sure about the water with baby Day Geckos either,I have never tried it.Small lizards have the ability to drown in almost anything.I have had lizards(not geckos) drown in milk carton lids. Shame you didn't get a bigger viv really. It's going to be a pig to find anything that can be kept in such a small viv AND with water. The water area eats into the land mass rather a lot, ruling out quite a lot of frogs. Thank you - Santorini is just as beautiful as the photos. I'm afraid, with all due respect, I've got to disagree with you. Phelsuma keepers all seem obsessed with bamboo perhaps because they've all read the same care sheets which appear to be nearly copy & paste jobs, and they've all read the Phelsuma 'bible' by Greg and Leann Christenson. I prefer to look closely at the native habitats and make my own judgement, as well as taking into account what others have found. P. cepediana are endemic to Mauritius where there is no bamboo and they instead make use of palms. I find baby cepediana seem to love parlour palm hence since the photos I've added a nice big plant in the middle (I couldn't find any locally at the time of build but it was always in plan). They bask on the branches and leaves of the palm as well as on the background and mopani wood which has loads of nooks and crannys making the tank more three dimensional. The keeper who had my cepediana pair before me emphasised bamboo and sanseveria plant to no end and also worried about the tiny waterfall I had in the adult tank. He also never had any luck with his breeding plans with the cepediana unfortunately. My female has had 7 eggs so far this season - the first 5 of which all hatched and the little babies are growing like weeds. The other two are due shortly. Not a piece of bamboo to be seen in the adult tank. So I gotta say I'm pretty confident with the conditions I keep them in and feel damn proud of all the babies I've hatched compared with most cepediana keepers I've heard from. As for the water thing there is literally a rock to crawl out on within 1cm of any open bits of water. I've already witnessed two babies jump or fall into the water from the glass, and simply swim to the nearest rock. Animals have to deal with water in the wild and Mauritius rainforest is full of water-filled leaves etc. I don't believe any healthy animal that has water in their native habitats should have a problem with a tiny bit of water provided there are ways out. If any of the babies drown, I'll eat my words. For me, the key to cepediana care is lots and lots of dense cover so they can be completely hidden if they wish, and a quality diet. brittone05, samhack, marcuswinner1 and 3 others like this. Well I certainly disagree.Its got nothing to do with Leann Christiensen.I have spoken to Dutch and Geman Phelsuma keepers in the main.They are light years ahead of the British and Americans,as they are in my view on Dartfrogs.Its tried and tested.Breeding these animals is quite easy its more difficult to regularly get males of the Mascarene species,thats why males always go for a premium as opposed to females. I keep borbonica mater, cepediana, inexpectata,klemmeri ,guimbeaui etc.They like bamboo because it is smooth and they can move around the side of the bamboo to escape prying eyes.Another thing with bamboo is that they will often hide inside and females will lay their eggs in the hollow.Its easy then to put some netting over the top of the bamboo and hatch the eggs in situThe hollow allows them to escape excessive heat as well if they are being chased by their mate.Thats why the majority of keepers use bamboo,whether it is native to Mauritius or not.Its certainly native to some parts of Madagascar. Its the same with Sansevera.It has nice smooth flat leaves that allow the geckos to get out of your eyeline,and they often deposit their eggs on a leaf.Its much easier to cut the eggs and leaf off the plant rather than put a cup over the eggs if they are laid on the glass.Usually in this instance the female gecko will lay in the corner where it is difficult to cover them. Whilst in the wild they will come up against puddles I sill dont think that its advisable to have a water area for the babies.They only need to panic and they will get cold and drown.Trust me baby lizards can drown in the smallest water as I already said. I'm not denying bamboo and sansevera are suitable, what I am saying is there are other, equally suitable, ways of doing things and some keepers tend to stick with what they've heard works but not consider other things. I know how bamboo works for them - I have had bamboo in their tanks before - I just felt that I it wasn't actually anything amazing and the geckos didn't really use it so I took it out. My geckos have loads of branches and leaves they can bask on, hide in, lay eggs on etc. Most branches are round and smooth enough so they can dart around the other side to hide.... Whatever she lays eggs on I just snip off the leaf or whatever to incubate ex situ. I don't think my method is wrong seeing as I've had 100% success so far when their previous keeper had none. And it's not 'easy' to get 100% success with cepediana - I've spent hours on the phelsumaweb.nl forums, where as you say the Dutch are years ahead of us, and I've seen countless babies die or eggs fail to hatch, whether they are trying to experiment with methods for getting more males or not. This following image is an example of something very similar to what a keeper I know uses as a good standard Phelsuma set-up. No wonder they spend loads of time on the bamboo - theres nothing else in there! I'm not trying to say that's how you keep yours, I'm just saying a densely planted tank with lots of hiding places is always going to feel more secure to a gecko even if there is no bamboo than something so sparse as the tank below where inside the bamboo is the only place they aren't exposed. Anyway, each to their own - I feel my geckos are very healthy and happy and I've had great breeding success so of course I'm not going to change that. I also think you can't really group cepediana in with other day geckos as each species actually has quite a different native habitat in terms of humidity and temperature. thanks guys good read !!!!!!! beaniebopps and Spot like this. Congrats on getting married Beanie. I thought you did a nice job of the viv and thats without knowing whats in it. Anyway thats all i`m saying on the matter . D. Tinc Leucomelas Available Soon. Nah i think you should show what your doing and Colin's imput is great,your thoughtful(both sides) debate give us all something,to think on,gecko keepers or not,lets face it your not hurling rocks at each other just both stating valid points of view.